Early in the week in less than 10 laps I did a 1:59.6 to match my qualifying from 2017. Unfortunately, that made me believe that 1:58s were a sure thing and I didn't get back in the car till Sunday afternoon by which time Brandon Smith was in the 58s. On Sunday, I probably did another 40 laps before I matched what had come so easy a few days earlier. I flailed away with two different final gears, many sessions trying to decide which one to use, unusually deciding against 2017s taller set which I surely had spent lots of time choosing in that season. Under different circumstances I would have done some post-race testing with both gears but in the end the shorter one seemingly should have been better everywhere except for the end of the front straight and between T10 and T11. Brandon checked out in Race 1, had a good race with KJ for second place, not sure where I gave up P2 to him but it was fun trying to gain it back. Race 2, I am losing out by being cautious early in the first lap, for I WANT the slower guys to establish themselves comfortably at the front and for us to pass them cleanly but without live race stewards and consequences our standing starts unfortunately are feeling more like motocross than automobile racing to me at the moment. After watching Cameron Wagner's SCCA Runoffs race and before our race, I found myself pondering rolling starts, even though I hate 'em because I think that they spread the field. FWIW, rolling starts are more common in club racing. Out of curiosity, I'm going to check what SCCA did with the real world Trans Am series. A rolling start for Race 2 only seems like it would be a decent compromise and expand our skills / experience. Anyway, Race 2 was great fun but and was well on its way to statistically being our best race of the season with the top four Pros bumper to bumper until I slammed into Pat at T14 on Lap 10 which come to think of it is about when and where I went deep in Race 1, probably brakes faded away, impossible to tell without a real life brake pedal. Sorry, Pat and Brandon, ruined their race and mine at that point. Pat saved it but lost a big gap to Brandon, I spun to a stop and something was wrong with the front of the car but secure with P5 miles behind. Next up is Somoma Raceway, my home track. I am hopeful that a big effort will turn my fortunes around and I finally have a good mistake and incident free pair of races, especially as I've used up my allotment of free races for the season. The seldom used NASCAR layout makes this a bit of an unknown, have to go back several seasons for stats and the cars have changed a little since then so all we can do is as perform to our maximum and hope that is good enough. Couldn't find the 1:59 times I've done before here in practice or Qualy, settled in at 3rd on the grid. Race one: Got a good start and as the race progressed Brandon and Tom were pulling away from me and I was from Pat in 4th. Looked like Tom and Brandon got to racing each other which allowed me to pull closer to them. Then in the later part of the race Tom started to make some mistakes and I was able to get to his bumper. He went wide in a corner allowing me to get to the inside and from there I was able to pass and keep him at bay. Had nothing left to catch up to Brandon in the last laps, brought it home in 2nd. Race two: Some how Pat and I were able to get up towards the front leading into turn 1, Pat passed Barry for the lead and I behind in 3rd. Turn 2 I got to the inside of Barry and was able to pass him. From there I chased Pat around for awhile until I was able to pass him to for the lead. With still a lot of race left I was concerned about Brandon, Tom and him raced Pat for awhile for 2nd spot letting me get a little gap. Eventually as the race was going into the later laps Brandon got through for 2nd, but to my surprise I was able to keep out front with a gap for the win. Although I've had some good results here and in the past I'm not a fan of this track at all and that feeling has been expressed by others, that may have contributed to the low turn out. Lucked out on a Saturday practice session with Brandon and his setup...Thanks Brandon! Not like anything I've ever tried but was instantly faster but much harder to drive. Results are posted (pics coming). Ah Tom.................I know Brandon was fast, but his fast times were in the 1:58's and check Sportsman too. I don't think I was off pace by 46 seconds here. Fixed, thank you for the alert, I was apparently so happy to copy and paste from last week that I forgot to change lap times. 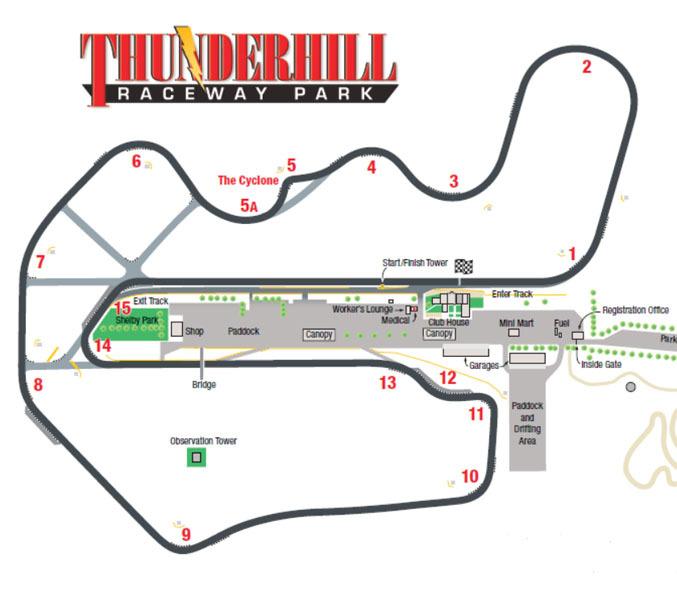 I realized while working on the results for Round 4 that the points for pro class at Thunderhill were incomplete; both the results chart and points standings have been fixed.